Market Deeping celebrate an early wicket for Ali Sharp against Lincoln. Photo: Tim Wilson. Market Deeping are joint-top of the Lincs Premier Division after surviving a nerve-shredding finale in their game with Lincoln at Outgang Road yesterday (April 30). 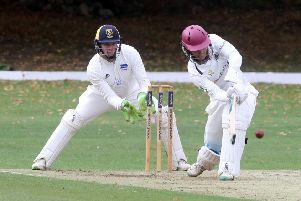 Deeping won a tense encounter by one wicket after despatching Lincoln for just 121. Wicket-keeper Dave Sargeant (22no) and Aussie import Zac Simmonds put on 14 for the last wicket to edge their side over the line. Meli Adatia during his miserly spell of bowling for Market Deeping against Lincoln. Photo: Tim Wilson. Deeping have now won their two completed matches to sit at the top of the fledgling table alongside the highly-rated Grantham side. “It’s obviously great to be top after tricky games at Grimsby and against Lincoln,” Deeping skipper Dave Gillett stated. “But this was a closer game than it should have been. “There is no way it was a 243-19 wicket, but we got over the line in a tense situation and that’s encouraging. Adatia, an off-spinner with a flat trajectory, returned the miserly figures of 2-16 from 17 overs (eight maidens) and six of those runs came from one over. Simmonds, another slow bowler, bagged 4-46, while there were first wickets for the club for recent recruits Dan Bendon and Ashley Fisher. But Deeping almost ruined all the good work when it was their turn to bat. Openers Chris Jones and Alex Wheatley added 36 for the first wicket, but nine wickets promptly fell for 72 before Sargeant and Simmonds eased the nerves. Bourne are off the mark after despatching newly-promoted Boston by 122 runs. Once more it was a Bourne opener who contributed the bulk of the runs, but skipper Pete Morgan, who scored an unbeaten 270 the week before, was this time over-shadowed by Ben Stroud who made 78. Stroud enjoyed a key stand of 52 for the sixth wicket with Tom Dixon as Bourne battled their way to 185. And the whole of Boston failed to match Stroud’s total. They were shot out for 63 with Jack Berry (4-29), Colin Cheer (3-29) and newcomner Matt Kidd (2-3) all on form. Bourne 185-9 (B. Stroud 78, C. Wilson 28, J. Berry 22, T. Baxter 5-38). Boston 63 (J. Berry 4-29, C. Cheer 3-29, M. Kidd 2-3). Lincoln 121 (L. Robinson 25, Z. Simmonds 4-46, M. Adatia 2-16). Market Deeping 122-9 (D. Sargeant 22no, M. Rutherford 4-45).